Personal records, photographs and family stories help people to remember significant events and milestones from childhood: where you went on holiday when you were 7, what part you had in your first school play or when you lost your first tooth. But if you grew up in care these things may be missing or inaccessible. 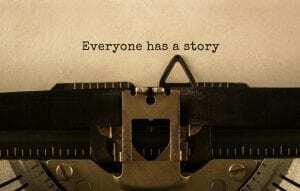 Not only that but you might have a particularly complex personal story, involving lots of foster or residential placements and people coming into your life for brief periods. As a result care leavers often have significant gaps in their stories and unanswered questions about their lives. In the absence of family archives they turn to records held by the local authorities and charities that looked after them. These organisational records are their personal histories, helping to create and reconstruct narratives about the past. 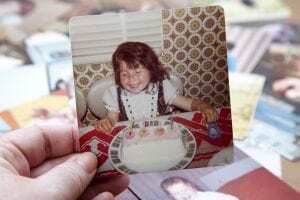 Photographs like this help us to remember our childhood. Since the 19th century vast quantities of information about children and families has been collected as part of social work activity. These files look different depending on when and where you were in care. They may have been produced by lots of people, including social workers, teachers, family, foster carers, residential care workers, health services and the police. In some cases files can run to 1000s of pages. Some may include highly personal things like photographs, letters and school reports while others are official, repetitive and full of jargon. Either way this ‘paper self’ is hugely important, both for how children and young people are understood and treated while they’re in care, and for how they understand and treat themselves later in life. Charities and local authorities in England hold files on hundreds of thousands of people who have been in care. Asking to see your care file is a big decision that can take years to make and the process is often difficult. Some records have been destroyed and others are lost in confused records management systems. People can wait over a year to receive any information. Where records survive they may be fragmentary, contradictory and contrast sharply with a person’s existing memories. Information about family or carers might be blacked out – ‘redacted’ – and documents sometimes leave out the important emotional details. Photographs, school reports, swimming certificates and other personal documents only survive in about 10-20% of cases. In other words care records often conceal or obscure as much as they reveal. Care-experienced people report feelings of powerlessness, frustration, anger and trauma in trying to recover their childhoods from their files. This isn’t the whole story – lots of people find positive things in their records too – but it’s definitely a recurring theme. The Access to Records Campaign Group (a collaboration of voluntary organisations led by The Care Leavers Association) have been making the case for better support and resources for access to records for the last decade. 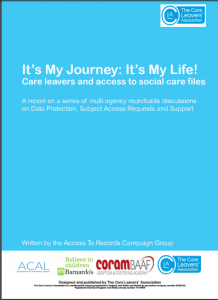 Their 2016 report It’s My Journey, It’s My Life drew on the experiences of care leavers and social care practitioners, and set out the practical, legal and emotional challenges that face people who access their records. 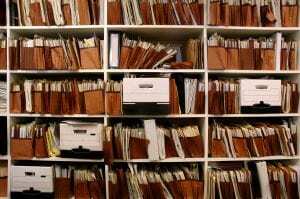 The arrival of GDPR (General Data Protection Regulation) in May 2018 and the role of records in the Independent Inquiry into Child Sexual Abuse (IICSA) has also highlighted the value and complexity of social care files. MIRRA is a research project that aims to support the rights of care leavers by exploring how child social care records have been created, kept and used in public and voluntary organisations in England from the mid-20th century to the present day. The acronym stands for Memory – Identity – Rights in Records – Access. 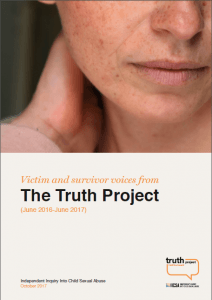 It is a participatory action research project co-produced with care leavers in partnership with the Care Leavers Association. Ultimately it aims to make positive changes to social care recordkeeping and through those changes improve the care leavers’ experiences. On this blog we will be sharing our research journey. We will talk in more depth about the project and what we are doing, featuring posts from the research team and from care leavers and others. If you have something you would like to contribute, please do get in touch.